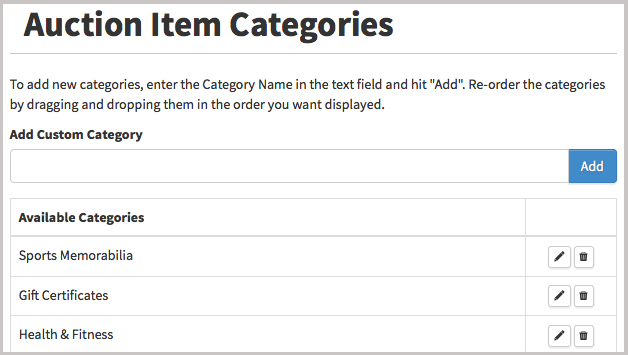 Knowledge Base > Auction How-To’s > How do I create, add or reorder categories? Item categories can be created to display groups of items. You can edit category names or reorder each category by dragging and dropping them in the order you want them listed on your auction page. 1) Under “Items” in the sub menu you will find an option for “Custom Categories”. 2) You will see a field to enter a new category name. Once the new category is entered, click “Add”. You can also delete any default categories.